Rufus Sewell portrays Obergruppenführer John Smith in The Man in the High Castle TV show. Rufus Sewell portrays Obergruppenführer John Smith in The Man in the High Castle TV show. The series is set in an alternate history of North America. Where Nazis won the second world war. John Smith is one of the main villains and protagonists of the show, he is a ruthless guard dogs of the Nazi regime. In charge of rooting out the rebel organizations, he will stop at nothing to weed out the disloyal citizens that cower before him. We find there is also a terrifying yet fascinating juxtaposition of his Nazi uniform look and his All-American family man off-duty clothes. But beware ! This costume is only for masters of controversy. People around you might get offended. 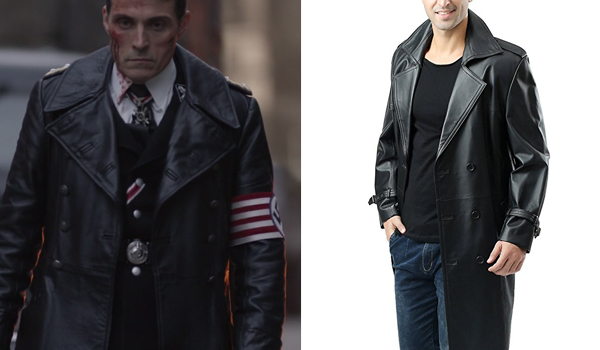 The coat that Rufus Sewell wears in The Man in the High Castle for his John Smith role as a Nazi officer is a full length black leather overcoat. It is custom made exclusively for the show by costume designer Audrey Fisher. All is not lost however, as you can have a similar look by wearing a similar coat. For a one-time cosplay/costume we recommend the Giovanni trench coat, cheap yet best bang for your buck. If you are thinking about wearing a quality overcoat on a regular basis however the best is the BGSD Xander coat, which also happens to be very similar. 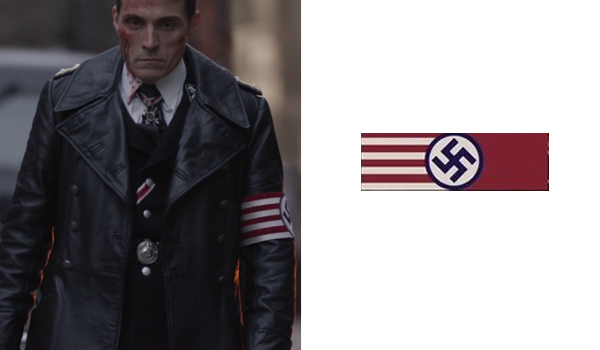 The armband that Rufus Sewell wears in The Man in the High Castle for his John Smith role as a Nazi officer is the american version of the classic all-red nazi armband. It is custom made exclusively for the show by costume designer Audrey Fisher. You can make it yourself by printing the pattern (easy way) or buy some fabric and sew everything yourself. Here's a link to the correct stripe fabric. 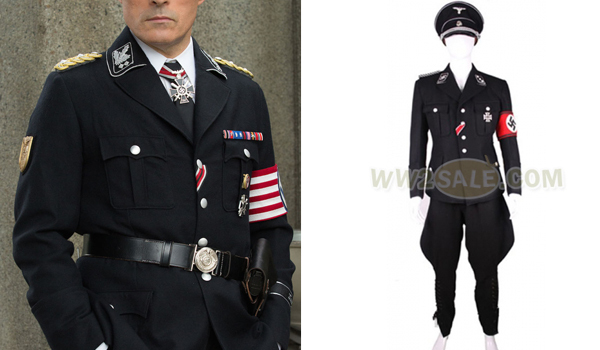 The uniform that Rufus Sewell wears in The Man in the High Castle for his John Smith role as a Nazi officer is very similar to the World War II Gestapo uniform. It is custom made exclusively for the show by costume designer Audrey Fisher. Here's a whole uniform set that includes historical replicas of the tunic and breeches. You can also add the insignias to your order. 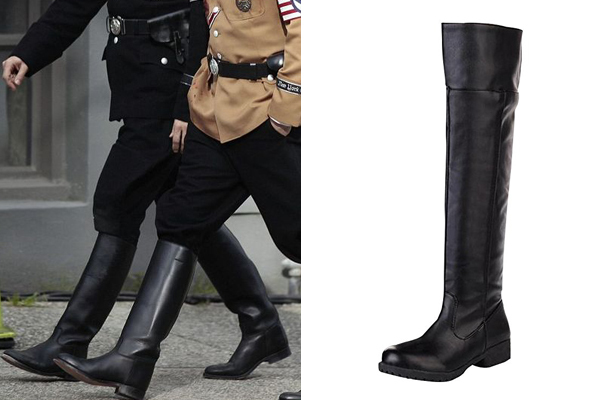 The boots that Rufus Sewell wears in The Man in the High Castle for his John Smith role as a Nazi officer are black leather boots that go up to the knee. These faux leather boots are affordable and very similar. 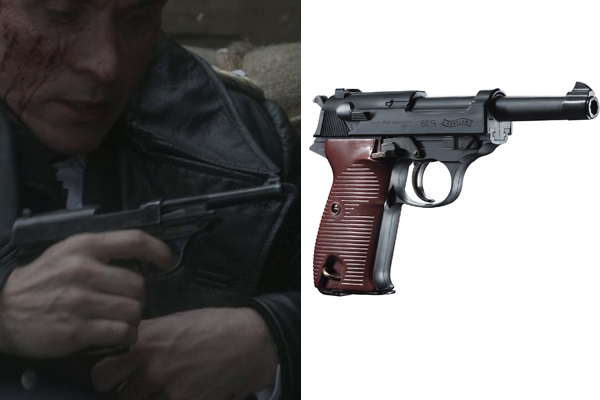 The gun that Rufus Sewell carries in The Man in the High Castle for his John Smith role as a Nazi officer is the Walther P38. Want to say something ? There wasn’t a World War II Gestapo uniform. They were the secret state police and were in plainclothes. The Allgemeine SS (general SS) wore black suits. When he got the call from Joe, late at night telling him that he was going to meet the MITHC, where can I find the robe he was wearing?